Learning A Better Way Of Hitting? Anger when you struck out at a critical time? Lack of Confidence in your pitching or batting? Losing to teams you think you are better than? Striking out over and over again and not know how to get out of your slump? Trying hard to play well and it doesn’t work? You keep missing balls, catches or throws? Are you in a slump and don’t know how to get out? Is your batting average lower than it should be? Even if it is really good, the specific techniques you will learn from me will make you a better batter. Do you know why I can say this? Because I am willing to bet that you don’t know how to make contact with the ball. Up to now, you just hit it, but how are you able to do it? I will teach you the science behind hand and eye coordination. If you are a pitcher, do you have proven techniques that will increase your consistency and accuracy? Even if you are not a pitcher, the techniques I will show you will improve your throws. And, how about your fielding? Do you really know how to catch the ball? Yes, I know that you may be pretty good, but do you really know any techniques that will really cut down on your errors? Up to now, you just bat, catch and throw the best you can, but how are you able to make make more hits, throw with more accuracy and field with fewer errors? If you will let me, I will teach you the science behind hand and eye coordination. We can start by scheduling a complimentary, no obligation evaluation of your game. Just email me or call me to schedule a day and time. My email address is: david@pureperformancesports.com or phone me at 360-305-7084 anytime between 9AM and 9 PM Pacific time. 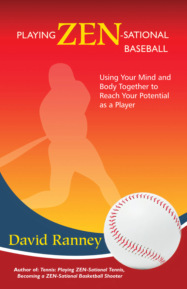 To learn more about playing Zen-Sational Baseball, please go here.